The Wednesday Jennersville Farmers’ Market is winding down. We had a lot of fun, met a lot of great people, and made some new friends- from the market owners, to the other great vendors, and our wonderful customers. So for something special, instead of serving samples of all our cheese like I usually do, for yesterday’s market I decided to feature two flavors in two different cheese spreads. I used newest flavor, Cheddar with Old Bay, and a customer favorite, Hot Pepper Jack. 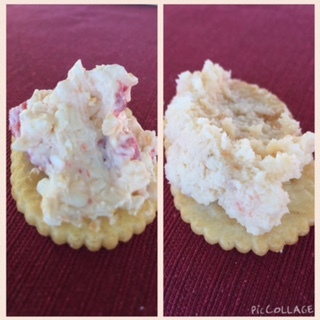 I came up with two great cheese spread recipes using these two cheeses. If you make either of these, I’d love to hear how they turned out! Or, If you’ve made another great dip or spread recipe that uses Compass Farms cheese, let us know below! Maybe we’ll feature it at an event! Mmm! Which one will YOU like best? Combine the shrimp and onions in a food processor; process briefly so they still have coarse texture. Add the shredded cheese, cream, lemon juice and mustard; process briefly. Add butter and salt; process till smooth. Refrigerate until ready to serve. Beat cream cheese, mayonnaise, and sour cream in a bowl with an electric mixer until smooth. Stir in shredded cheese and pimentos. Cover and refrigerate until ready to serve.